I've heard my fair share of tales of car ownership, and up until recently, I'd have said "I've heard it all." Stories ranging from lucky back-yard finds that cost little more than a 6-pack of beer, to long cons, with enthusiasts spending years convincing others to let go of their prized vehicles. Anthony Herrera, however, begins his story a bit differently than most. Anthony, his friend Horace, and I stood behind an industrial building, snapping photos as the sun fell from the sky and rapidly approached the horizon. While some owners stand quietly during a shoot, waiting for it to end, Anthony had stories to share. He told of his highs and lows with the car - he elaborated on his future plans, and he explained his motivations and his roots. However, it was where the story of the Chevelle began that truly caught a laugh. "I was on Craigstlist, hunting for a pingpong table," he told me. One way or another, his searches for "pingpong" turned in to "1967 Chevelle," and before he knew it, he and his old man were standing on a front porch, knocking on the door with cash in hand. I've had my own adventures on Craigslist, but Anthony's antics certainly beat any story I can share. Finding the Chevelle, however, wasn't left entirely to chance. Anthony admits that, more or less, any searching on the pages of Craigslist, given enough time, devolved into the hunt for the perfect example. It was only the pingpong table that led to him finding "the one." The Chevelle, when he found it, was in good shape. 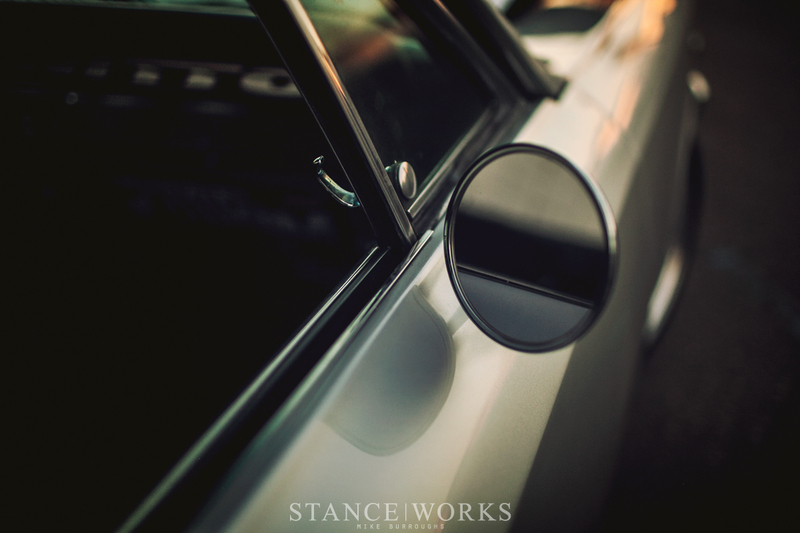 The body was rust free and as straight as could be, with fresh paint on all panels.. It wasn't, however, without its issues. The previous owner had run out of money to finish his project, leaving plenty of electrical and driveline issues that needed to be solved, among other tidbits and trinkets. As Anthony explains it, he lucked out - "it was a guy who was down on his luck and selling off his yard full of toys." Anthony's hunt for the Chevelle had been a long one. After his first trip to the California's famous Pamona Swap Meet as a child, Anthony's fever for American iron was burning hotter than ever. "In the beginning, I was just looking for something American. 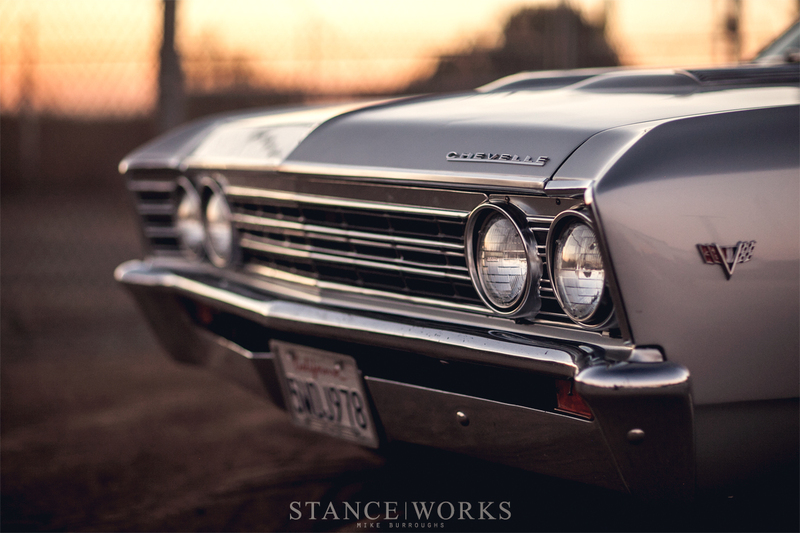 After more than a few trips to some car shows and swap meets, I knew that I wanted a Chevelle." Finding the one he has now was a rather serious victory. However, as a high school student with little time and money to make headway on his newfound project, the car sat in the family garage for nearly two years before seeing the light of day. After graduating, Anthony was able to spend the time needed to put the car back on the road. The steering rack was rebuilt, the carburetor was replaced, the front fascia was rebuilt, and interior trim pieces were tracked down. 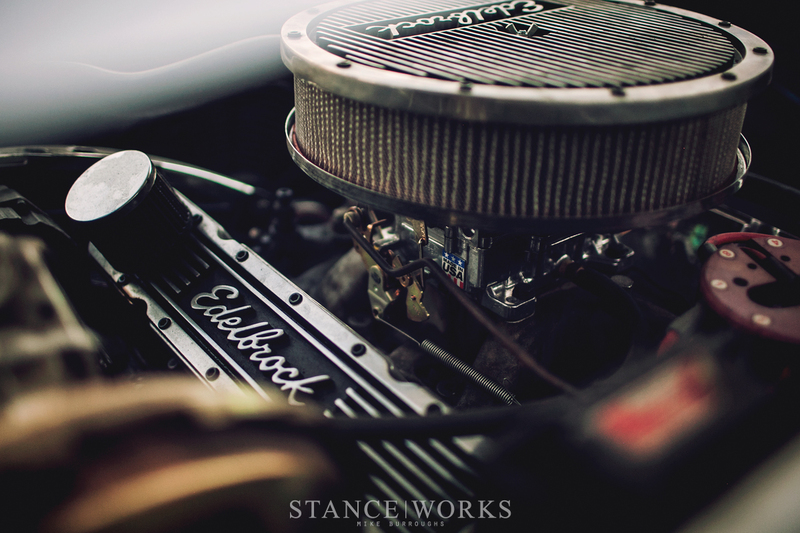 The column shift was swapped to a Hurst V2-Matic ratchet shifter, and under the hood sits a 350 cubic inch small block Chevy with factory camel hump heads, an Edelbrock manifold, a 600cfm carb - all hooked up to a turbo 350 transmission and sent to the factory rear end. The suspension overhaul was enough to get the car drivable and looking good, but Anthony has higher hopes in the long run. 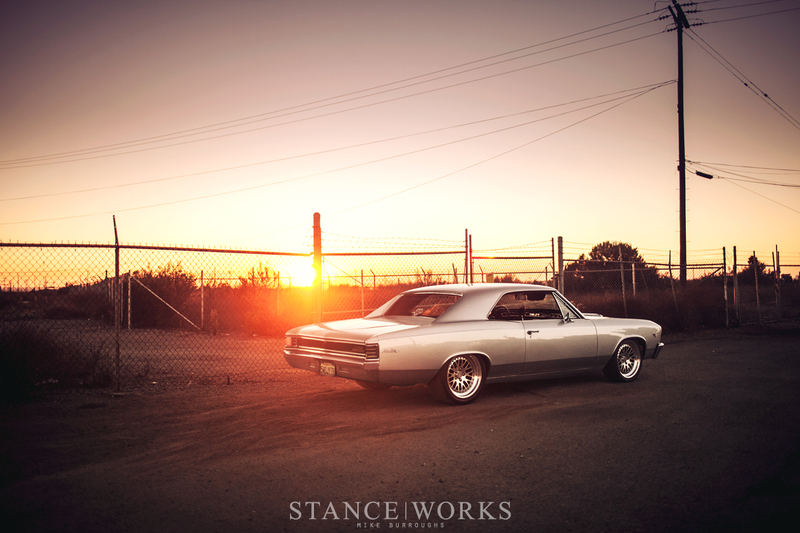 Monroe gas shocks in the front and air shocks in the rear are paired with OPGI 3" drop springs on all four corners. In the end though, he's thinking about a pro-touring/trans am package. "Something about getting a 47 year old "mid size" steel Chevy to turn a corner properly excites me." 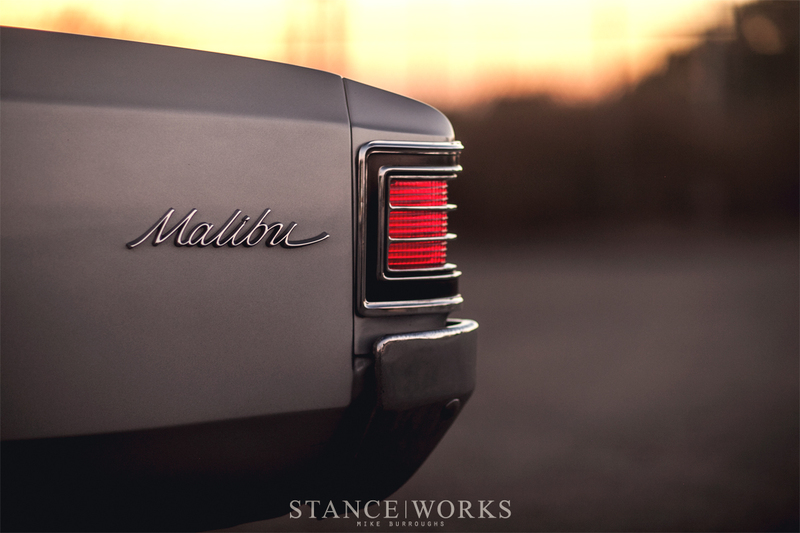 The exterior of the Malibu-packaged Chevelle was treated to an SS hood and SS painted rear-panel. 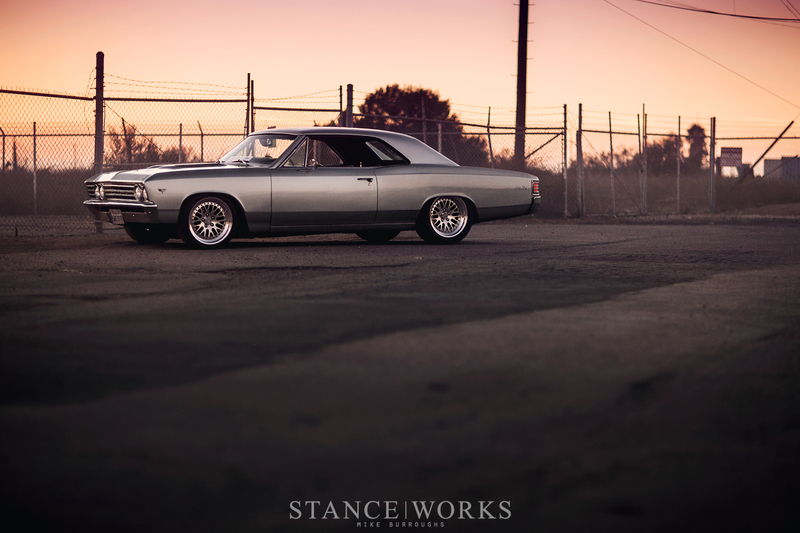 The front fenders were hammered smooth, to stop the tires from rubbing, but aside from that, Anthony insists "it's all classic '67." The only other notable change is the CCW Classic split wheels. 18x8s in the fronts and 18x9.5s in the rear are wrapped in Nitto INVO 235s and 275s, respectively. Anthony insists his favorite part of the car is the interior. Tweed seats front and rear are embroidered with the Chevy bow-tie - not particularly his style, but his plans in the long run are to swap them out for proper buckets. However, the embroidery doesn't matter: "It's where I spend most of the time, and I just love looking at the classic cluster no matter how inaccurate it is, and simplicity of the overall dash. There's not a lot to it." 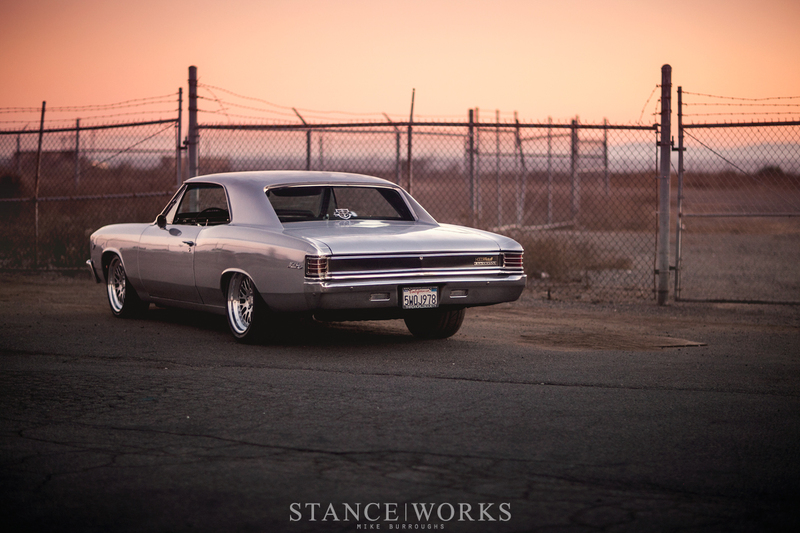 We shot overlooking the empty lot until the last hints of sunlight disappeared and the sky began to fall blue and purple, the bright silver paint of Anthony's Chevelle still glowing against the background. It was clear, after an evening of photos that Anthony has a true passion for his car - his pride and joy. His plans for the car as time goes on are lengthy, but even more lies on the horizon. 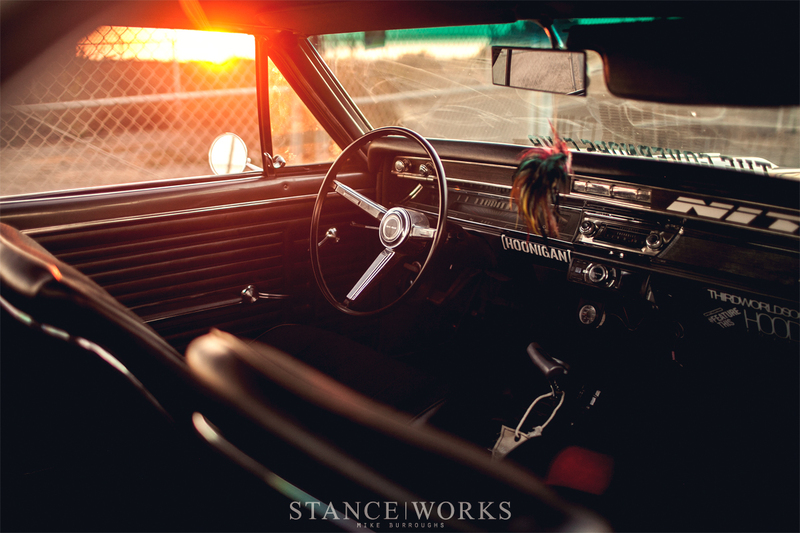 "I had actually wanted to build a 1963 Impala and go down the low rider route. Unfortunately, that kind of money just wasn't there so I decided to go hot rodding. I have absolutely no qualms about going with a muscle car instead, but if fate has it, I would love to build my impala later on in life." Needless to say, we're anxious to see it. 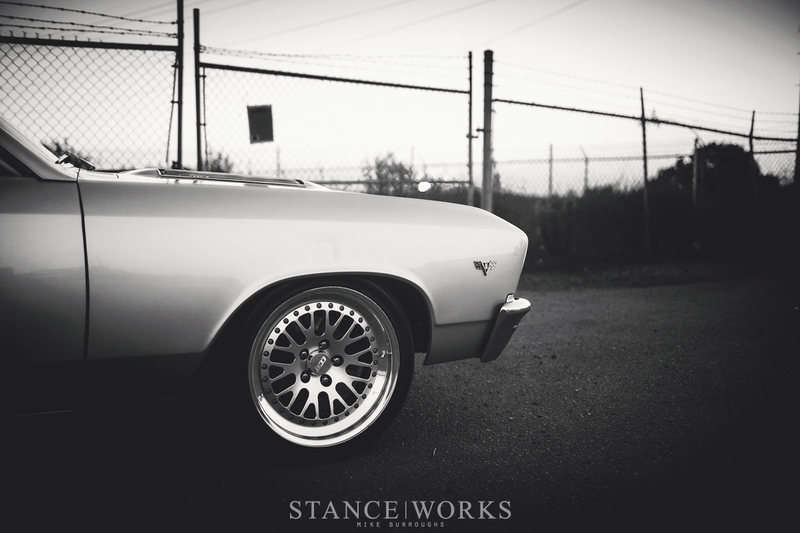 Love that i got on here to show a friend some stanced cars and the first thing i see is this beautiful Chevelle! ErnestJohansmeier The comments here, on Instagram, and Facebook say otherwise. We like all things with four wheels. And two. And more.